Can You Regrow a Dead Lawn? More often than not, you can still revive a dead lawn without having to pull it apart and start all over. Success at reviving a dead lawn depends on the how long the grass has been dead; generally, any lawn that appears dead for a short period spanning 3 to 5 weeks can be regrown. Troubleshooting and care also factor in, and will depend on what caused the death in the first place. Drought and watering restrictions combined is responsible for a major chunk of lawn deaths in summer, especially in dry states like California. 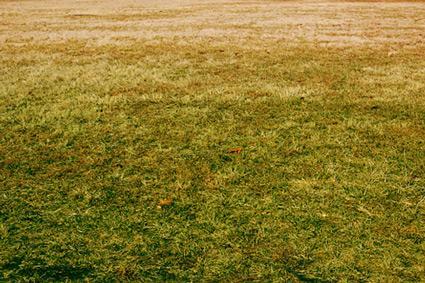 Lawns that become brown and brittle in the height of summer have a way of reviving themselves as the temperature dips and light rains provide some welcome moisture. That is because grass goes into dormancy when there's scarcity of water. The top growth is sacrificed for the sake of survival, but the deep roots of grass remain alive. When water rationing is lifted, as long as you're within the general 3 to 5 week recommendation, you should be able to revive the lawn. A lot depends on the summer temperatures too. When the temperature is high, transpiration rates increase, and it takes a lot more of water to keep even the subsoil portion of the grass alive. If the lawn has been completely dry for over 6 weeks, you could lose it for good, so an occasional soaking is necessary to keep the roots alive. When the lawn appears brown all over, cut away the top growth in a small area and check whether you see some signs of green underneath. Water the area for a few days, and if you see new growth, you can be sure that it is possible to revitalize your lawn with regular deep watering for a few weeks. Mow the brown portion and run a rake through the lawn to break up the hard surface. When the ground has been dry and hard for a few weeks, you may need to plug the lawn to allow water to percolate deep into root zone. It can take several weeks to bring back your lawn to a lush green. Broadcast some rye grass seeds; they will sprout fast and turn the lawn green while you wait for the dormant grass to spring back. Just because it is summer and water restrictions are in effect, we cannot assume that it is infrequent watering that has caused your lawn to turn brown, especially if you see patches of brown interspersed with some green areas. Too much thatch could be the problem here. Grass can survive through periods of drought on a surprisingly small amount of water as long as the water reaches the root zone. The University of Illinois has determined the minimum amount of water required to keep the grass roots alive. It is just 1/3-inch water once in 3 weeks. The lawn will turn brown, of course, but the roots can be kept alive. A thick thatch prevents what little water you provide from seeping into the soil to help the roots survive. When you can afford the luxury of soaking the lawn once or twice a week, thatch build up may not be so much of a problem. But when the amount of water given is very little, all it does is wet the surface. The whole exercise is futile since the water will quickly evaporate in the dry heat. Some people mistakenly think that leaving the grass clippings lead to thatch formation. The tiny bits of grass breakdown quickly, but the dead stems and roots do not. They form a thick, nearly impermeable layer. A thatch of ¾-inch is normal, but anything more than that can strangle the grass and cause patches of dead grass in summer. Fast growing grasses are more prone to thatch formation. To revive a patchy lawn due to thatch, first check its thickness. Dig out a small section and measure the brown area. If it is less than an inch, you can break up the thatch with a de-thatching rake. If it is much thicker, you may need to use a mechanical or powdered de-thatcher, depending on how much area has to be covered. Once the thatch is removed, water the lawn and feed it with a nitrogen fertilizer to help vigorous regrowth. Reseeding with a grass suitable for the season will help cover the patches where the existing grass has completely perished. It is not unusual for pests and diseases to damage a lawn, but they rarely destroy the whole lawn. 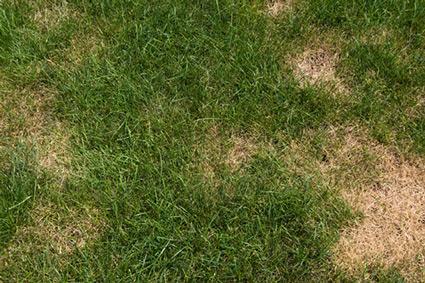 If you find patches of dead grass, big or small, it is worth investigating if some insects or fungus are killing your lawn. Take hold of a handful of grass and pull it; if it comes away easily, you might be having a disease or pest problem. The next step is identifying the exact cause. For example, check for grub worms by digging up a small area of the lawn. If you see several worms within that small area, you have to treat your lawn with one of the grub control methods available. Treat other identified garden pests, diseases, and fungi once you've established they are the culprits. There are a number of fast acting chemical pesticides, but if you use the lawn frequently or have kids or pets, it is safer to use neem oil or use biological control with nematodes or milky spore available in garden centers. A general fungicide will take care of most fungal infections, but they are toxic. Avoiding over-watering and keeping the thatch to a minimum may help avoid fungal diseases. Both salt and various chemicals can cause a lawn to die. Frequent feeding without good irrigation results in excessive salt build up in the soil. If you notice brown grass along the periphery of the lawn along your driveway or near the street, it could be salt damage from road salt or other de-icers. Salt can burn the grass roots and cause the lawn to die out. Your pets can cause dead spots in your lawn if they frequently relieve themselves on the grass. The wind can carry the herbicides you or a neighbor uses in nearby flower patches can kill your lawn as does water runoff from treated areas. If you suspect chemical burn, the least you can do is reduce the impact by thoroughly watering the lawn. This will wash away most of the residues. Adding gypsum salt or limestone may help. Reseeding may be necessary if there's extensive damage. If you water your lawn frequently, but not thoroughly, it can result in shallow root growth that makes your lawn susceptible to quick wilting. It may die on you suddenly if you skip a few days of watering. A sudden rise in temperature or dry winds blowing in your direction can decimate your lawn in no time. Run a lawn tiller over the lawn and water it thoroughly every day for a week to help the grass grow back. Then reduce the frequency to 3 days a week and finally to once a week, but always thoroughly, to make the grass run its roots deep into the ground. Broadcast some grass seeds to mask scanty areas. Cutting the grass too close can cause the lawn to die out, especially in summer. Water and feed to revive the lawn and then mow it with a higher setting. If you want your lawn to look tidy, the key is to mow it regularly, but not too closely. You need to leave at least 3 inches of grass in summer. There are a couple of other things you can do to keep your lawn healthy and lush beyond those mentioned for the specific causes. Aeration involves the removal of small soil plugs that are less than 1 inch in diameter. The holes allow air, water, and nutrients to penetrate to the roots which helps grass grow deeply and produce a healthy and strong lawn. If your lawn has a lot of traffic and is regularly compacted, it is a good idea to aerate at least once a year -- preferably in the spring. A healthy lawn should not allow room for many weeds to grow but if you get a general weed killer and feed all in once and apply it in early spring, you should be able to keep your lawn weed free. If you must, use an organic weed killer to control any spotty weeds. 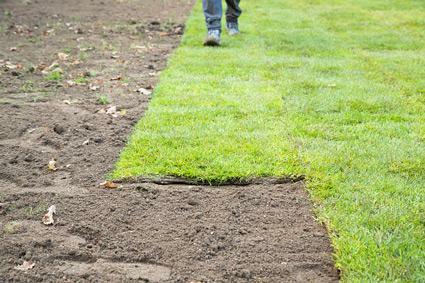 If you've properly diagnosed your lawn problems, initiated the steps for regrowth, and still see no life in all or even part of your lawn within one month, it may be time to consider a complete revitalization. You can tell if your grass is dead by conducting a tug test. Grab a handful of brown grass and give a tug -- if it pulls out without resistance, it is dead. You have two options when your grass is dead. You can start over again with fresh seed or even sod if you are in a hurry. Be sure to plant only grass that will do well in your growing zone. If you do not have this information, check with your local Cooperative Extension Office. Careful nurturing will bring back your lawn to its former glory, but it may take several weeks, so you need to be patient. Over-watering and over-feeding should be avoided as they can invite more trouble.